After the initial carnage of the zombie apocalypse and as you move outside for the first time, you and your fellow survivors must have a clear set of protocols for dealing with the various individuals and groups you will encounter, including other survivors, zombies and even wild animals. Remember, society will have changed – you will need to change your mindset to match a new and much harsher reality. The golden rule of the zombie wasteland is to never trust anyone. Sounds harsh but the various scavengers and bandits you meet as you forage for supplies will be desperate and you shouldn’t take any chances. Be polite and clear where you can but always back it up with force. Never appear vulnerable and be wary of any tricks designed to make you drop your guard. Basically, you should treat any individual or small group you encounter with caution. In the early days, things can be more informal but as your survivor group grows you will need to adopt strict policies to integrate any new people into your group. Here are some first-contact protocols for dealing with any new group of survivors. Always try to ‘encounter’ groups away from your main site. This will be mean scouting and search patrols. Better to assess them at a neutral location than at your own front door. On first contact, be firm and steady; carefully assess the group’s capabilities and intent. Most will be scared, embattled families just looking to survive. It may be an idea to create a meeting point at a prominent location away from the main base. You can daub giant signs or mark the roads with spray paint. You can then hide and observe survivors as they gather at your collection point. No matter how meagre your resources, all new survivors must go through the three stages of entry into the settlement. These are clearing, induction and integration. Some groups will leave you no alternative but to fight. They will seek out your secure location and even assault it. Be ready for human opponents as well as dead ones and ensure that the whole team is ready to defend what you have. These groups will prey on the weak so hopefully overt displays of strength will deter them. Where you come across a single zombie, it is always best to deal with them silently if possible. Avoid using firearms if you can as any noise will attract more of the walking dead. If you encounter a much larger group, known to survivalists as a ‘horde’ – then stop and move away as quietly as you can. Do not make any sudden dashes and keep your team in order. Be aware of wind direction as this may carry your scent. Never start a fight without very careful planning as you may find yourself facing more piling out from every side road or alley way. Many beloved household pets will be left to fend for themselves in the aftermath of a major zombie outbreak. Now, you don’t need to worry about roving gangs of hamsters but feral dogs will become more of a problem as time goes on. If you encounter a pack, never turn your back on it and slowly back away. Keep your weapon ready and if possible have some doggie treats in your kit bag which you can scatter liberally as you withdraw. If you or any of your survivor group encounters a 24-carat mental case then the safest principle is to avoid where possible. You may encounter them briefly for the first time, keep any exchange to a minimum and from then on avoid ‘mad town’. Where a crazy just sits watching you from a window or vantage point, avoid eye contact if you can. Do not look at them closely. They may just see you as potential raiders so move on and leave them in peace. If a crazy runs out in front of you and starts screaming about little people or any other such thing, you must remain calm. Use quiet and understanding language but keep one hand on your weapon. If possible, look for an opportunity to move on and leave the individual. Remember, the zombie apocalypse will put enormous pressure on people so don’t blame them for cracking up. Where you can, you should try to support those in need. Time is a great healer – maybe they will change their ‘crazy’ ways and they might join your survivor group. You never know. 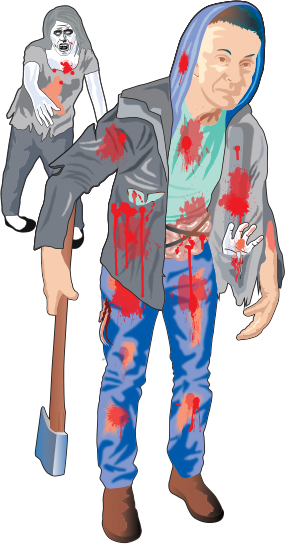 It is a common myth among many zombie survivalists that you can ‘fool’ zombies into ignoring you for an extended period by ‘dressing up as a zombie’. This tactic has been successful in tests for very short periods of time, but the moment the survivor starts to sweat or gets too close to one of the dead, the zombie will ‘clock’ the human. It is a dangerous tactic to use but one which can be relied upon for a few minutes of respite in an emergency. Emit a low moan or growl but don’t overdo it – this isn’t drama school. It doesn’t need to be continuous, get a feel for the vibe in your zombie group. If they are silent, you stay silent. Adopt a tired vacant ‘student’ look, with your head tilted to one side. Wearing a hooded top covered in blood can really add to the whole effect. Hang body parts such as intestines around your waist as a belt. Accessorise with other random internal organs in pockets. Ensure that all body parts are rotting. Wear a torn check shirt and ensure that it is covered in dried blood or at least red paint. Try to keep all flesh covered. Attempt a shuffling walk, possibly dragging one foot behind you. Again, don’t overdo it and avoid the temptation to go faster than the rest of the horde. Keep your hair greasy and caked in mud or dirt. Add make up to really get that ‘corpse look’. Drag a weapon along in your hand – it is important that you stay armed at all times. Zombies can often be seen dragging items so practise to make it look authentic. Avoid any close contact with the walking dead – even brushing alongside one of them could give you away if they catch the scent of a fresh human. Wear lots of deodorant if the weather is hot to help mask the scent of any sweating. And do not try to use this disguise if there is a chance of rain! Finally, avoid any other humans. It would be one hell of a way to go to survive the zombie apocalypse only to be killed by a fellow survivor who mistook you for a walking corpse!